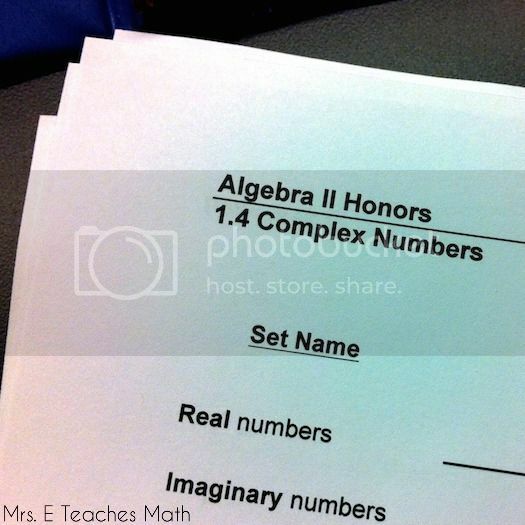 One of my goals this year was to use 3 act math tasks in class this year. 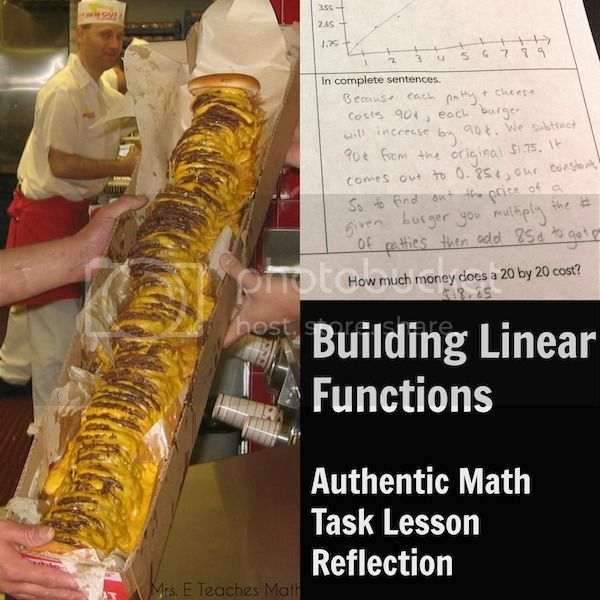 My first one was “How much does a 100x100 In-n-Out cheeseburger cost?” by Robert Kapinsky. Several weeks ago, I also tried the “Fall of Javert” by Mathalicious. Now, I want to tell you about my experience using “How did someone get a $103,000 speeding ticket?” by Robert Kapinsky. We were in the middle of our unit on the introduction to functions. 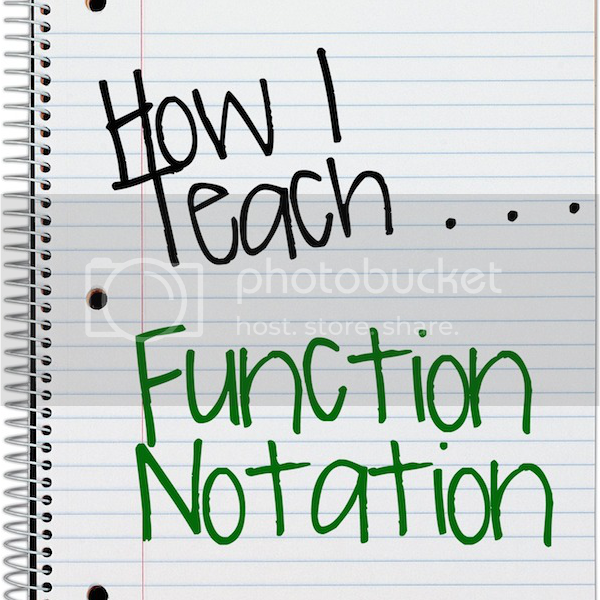 I knew that I wanted to review function notation during the lesson. As bellwork, I had my students graph the equation of several lines. It was easy peasy for them, but I like to throw in easy stuff sometimes to keep their skills sharp. I had put this lesson title on my student’s calendar, so there was lots of buzz about what we were going to do in class. First, I skimmed/read the Wall Street Journal article to my students. They interrupted me a lot to ask questions and interject their thoughts. They were not impressed with the idea of graduated fines; it made for an interesting discussion. When we got to the question, my students immediately knew what information they needed. I gave my students the formula to calculate the fine. I didn’t show them the code that the police use to calculate the ticket though. If I did this again, I probably would. Also, I didn’t mention rounding. I wanted to see if they could figure that part out on their own. I also wrote everything in function notation as I talked through the formula. What was Anssi Vanjoki’s monthly income? What was Anssi Vanjoki’s annual income? 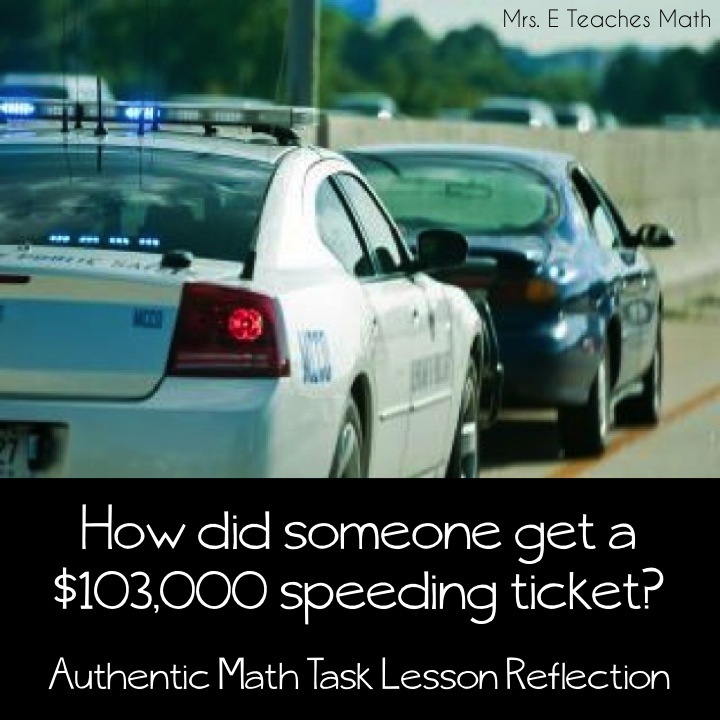 How much would the traffic ticket be if you received the same speeding ticket and made 60,000 per year? How much would the traffic ticket be if you received the same speeding ticket and made 45,000 per year? Convert all of your answers above to US dollars. Graph the equation you used for Anssi Vanjoki’s income and describe the graph. These questions were easy for my students. I knew they would be (because it was basically review), but I still really wanted to do this with my students. My kids are 15-16 and are just learning to drive. I knew this lesson would get them excited and really hit home with them. As they worked on the questions above, we kind of just talked as a class. A few of the students tried to think up what the “most severe” violation could be. They decided that a drunk driver crashing into a semi truck hauling babies and killing them all would be the most severe. Crazy kids. Also, my husband used to be a police officer, so I told them a couple of stories that he had about drunk drivers. Even though it wasn’t math related, I had their undivided attention, so I figured I’d use it as a life lesson. 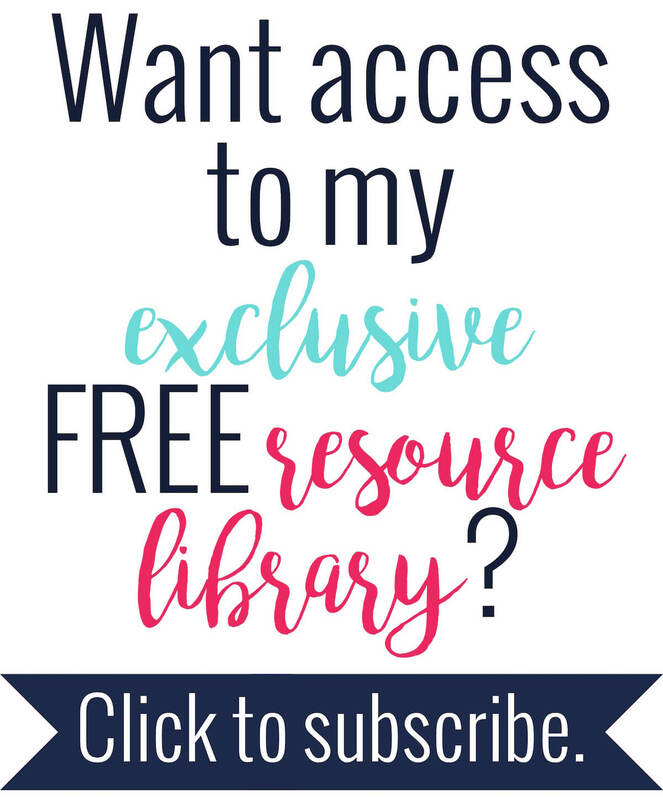 The hardest part for my students was keeping the monthly and yearly income straight. I’m not really sure why though. I really enjoyed doing this lesson with my students. Very cool to read. Here is something I wonder: what would have happened had you not given students the formula? What if instead you asked them to create fair formula would be to make it just as painful for rich people? Then you could have them compare their formulas to one another and ultimately to the official one. It might lead to interesting conversations. That isn't what I had written but seems like an interesting alternative. Thoughts? That's an interesting idea. It might be a good conversation topic/project for them to work on, and then I could tell them what they actually used in Finland. Once they figure out the man's annual salary, they could then use that to figure out what his fine would have been using their alternate formula. That's a really good idea for next year. I'm really enjoying your lessons. My kids respond so well to them. I have more planned for next semester :) I want to try to introduce a topic using one of your lessons, rather than using it as reinforcement. It's a little bit scary for me to try that, but I want to see how it works out.